Classical teachers hate it and audiences don’t expect it. What happens when two totally different musical genres meet? Don’t call it Hip-Hop. Don’t call it Classical music either. Ensemble Mic Nawooj calls it New Concert Music. By method sampling—the technique of borrowing sound bytes or scores from music and remixing it—they’re creating a radically inclusive space for musical performance. What started as tinkering for JooWan Kim while at the SF Conservatory of Music, has now become a movement worthy of national attention. When the country’s in need of barrier breaking, this ensemble brings together diverse audiences into one joyful, musical space. 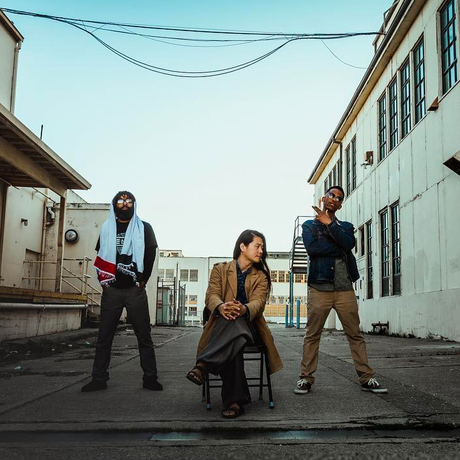 Led by composer/pianist, JooWan Kim, Hip-Hop Orchestra Ensemble Mik Nawooj (EMN) creates New Concert Music by sampling principles of Hip-Hop and classical. Executed with MCs/lyricists Do D.A.T. and Sandman, a lyric soprano, flute, clarinet, violin, cello, piano, drums and bass, the music is rigorous, nuanced, accessible, and free from the dogmas of Western European concert music aesthetic. The result is seamless tête-à-tête with “textures swimming through the sound…like the world’s fastest ping-pong game” (Pitchfork) and is considered the “cutting edge of hip-hop” (Huffington Post). After a successful performance of a novelty piece which featured an MC and chamber ensemble while JooWan Kim was completing his master’s degree at the San Francisco Conservatory of Music, the MC at the time suggested they make an album together. Six months later and writing about an hour of music, Kim had a profound shift in the direction of his writing. He felt that he found a way out of the stifling contemporary concert music aesthetic in this new way of composition. JooWan crystallized his ideas into Method Sampling, a principle of borrowing or sampling of rationales from related as well as unrelated fields, then reframing them into one’s own system. In 2010, JooWan Kim recruited his best friend from college, EMN executive director, Christopher Nicholas, to push the project forward in a serious way. Since then, EMN attracted some of the most excellent classical musicians and MCs in the SF Bay Area while gaining national attention from outlets such as National Geographic, ESPN, Wall Street Journal, Huffington Post, NPR, Pitchfork, Upworthy, NowThis, and more. They are represented by Opus 3 Artists.